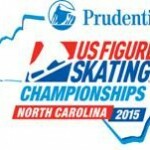 Twelve teams took the ice in the senior pairs competition at the 2015 U.S. National Championships in Greensboro, North Carolina. Heading into Saturday’s free skate, Alexa Scimeca and Chris Knierim have less than a five point lead over Haven Denney and Brandon Frazier. With reigning pairs champions and 2014 Olympic team bronze medalists, Marissa Castelli and Simon Shnapir, parting ways, these two teams have been favored to grab the top spot in the senior pairs competition in Greensboro. Scimeca and Knierim skated an entertaining short program to “El Tango de Roxanne” from the Moulin Rouge soundtrack. They nailed their side by side triple salchows and received high GOEs. They also received positive GOEs on their throw triple flip. They received level 4 on their triple twist, lift, step sequence, death spiral and side-by-side combination spins. They received 74.01 points. It is the highest short program score in U.S. Championships history. They are planning on doing a quad twist in the free skate. Denney and Frazier skated a dramatic short program to the soundtrack of the “Godfather”. Like Scimeca and Knierim, they nailed their side by side triple salchows and received high GOEs. However, instead of a throw triple flip, Denney and Frazier did a throw triple loop, which has a slightly lower base value than the throw triple flip. They received level 4 on their triple twist, lift, death spiral and side-by-side combination spins. In third place is the new team of Marissa Castelli and Mervin Tran.Though only being together since last spring, the pair looked like they were a seasoned team on the ice. They received level 4 on their step sequence, lift and side-by-side combination spins. They successfully completed their side-by-side triple salchows and throw triple salchow. Castelli: said, “Mervin and I are very happy to be here. This is his first U.S. nationals. I think we skated really well. We are really happy to be together and skating, and it was really nice to be back on national ice. Behind them in fourth place are Tarah Kayne and Danny O’Shea. This is Kayne and O’Shea’s first Nationals since Kayne had surgery on her right hip. They withdrew from both Grand Prix events so that they could concentrate on Nationals. Sitting in fifth place is the new team of Gretchen Donlan and Nathan Bartholomay. Nathan was the 2014 U.S. silver medalist and Olympian with his former partner, Felicia Zhang. Zhang retired in the spring to focus on her college education. Donlan previously skated with Andrew Speroff, who turned professional. The free skate will be Saturday afternoon.